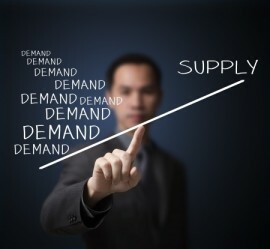 In this article, you will learn about the fundamentals of supply and demand trading. The idea has been around since time began and has been covered by many educators. I have my own interpretation and rules for this style of trading which I will go into at a later date, but for now, let’s look at the basics..
We are conditioned through education and trading books to buy when the price is high and sell when the price is low. This is the investment advice instilled in us from an early age, “buy stocks when they are rising, they can only go higher”. And more often than not, punters end up selling their shares at knockdown prices when the price plummets and the pain to hold them is just too much. Yet in every other aspect of our lives, we buy when something is a bargain and try and sell it for as high a price as we can get. So why should this be any different in trading? 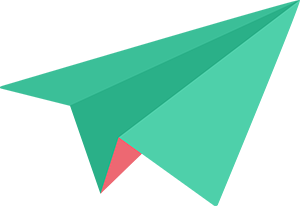 It shouldn’t, and this is where the professionals differ from the retail crowd. They buy low and sell high, just as your local car dealership might do. The pro’s buy at wholesale prices and sell at retail prices. 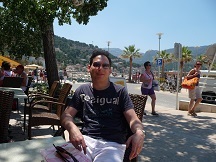 At this point, a transfer of funds takes place from novices accounts to the pros. The point at which this takes place is often what we call a supply or demand zone. 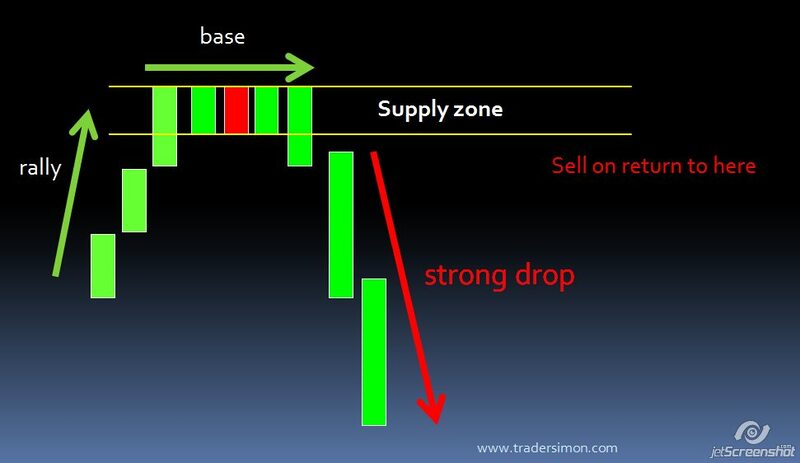 A supply or demand zone can only be seen once price speeds away from an area on the chart. It indicates there was professional buying/selling interest at the origin of that move. Once this has happened, our job is not to follow the novice traders and chase the move, but wait for price to return to the zone where we can buy or sell at a “wholesale” price. The charts below show how this looks like in graphic form. In the following pictorial representation of a demand zone, price dropped, made a base and rallied away very fast. This indicates there was a lot of buying pressure at the base. So, if I were to ask you whether the big traders and banks all managed to get their orders filled before this move?, the answer would be no. There would be a stack of buy orders all waiting to be filled once price retraced back to the demand zone, which is where we too would be looking to buy. Supply zones are the same concept in reverse. Price rallied, made a base and the traders couldn’t sell quick enough. 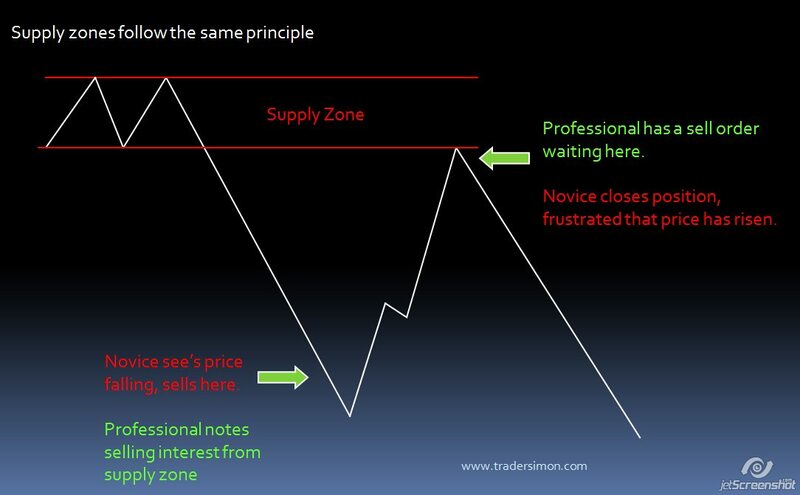 When price comes back to that supply zone, you want to be a seller! 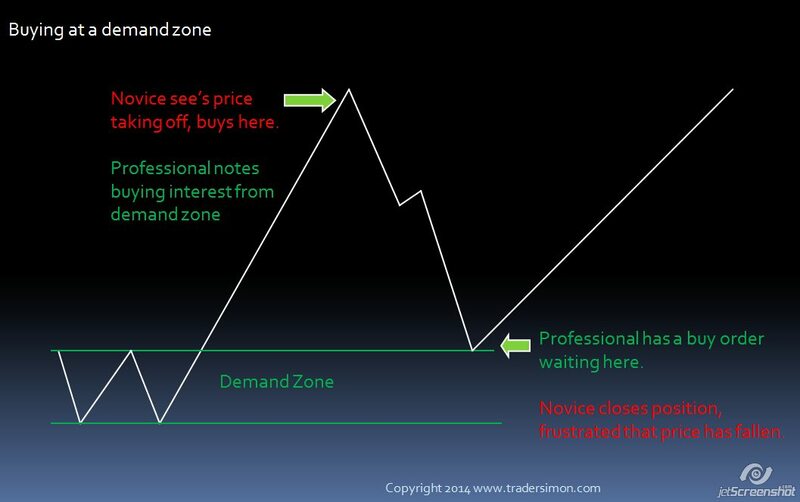 There is another type of supply or demand zone which is in-line with the current flow. 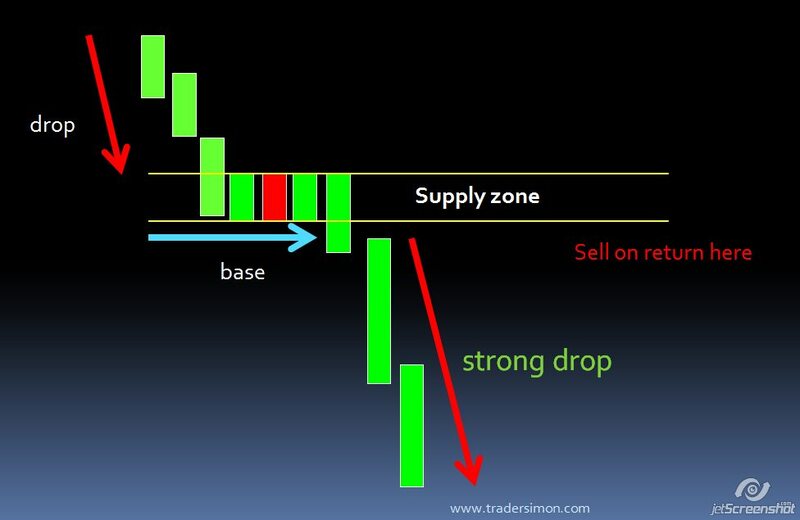 In this example the market drops, forms a base and makes a 2nd speedy drop. The consolidation of candles that it leaves behind become our supply zone. 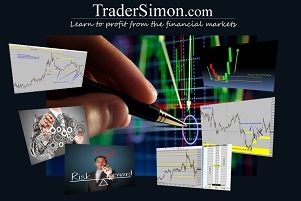 The reverse is true of demand zones – the market rallies, forms a base and makes a 2nd rally. 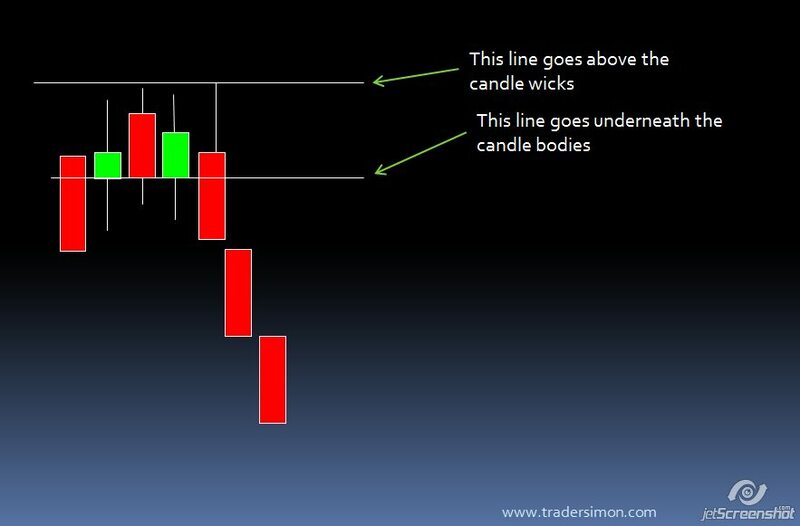 In order to draw a supply zone, position a horizontal line below the candle bodies. This will serve as your sell entry point. 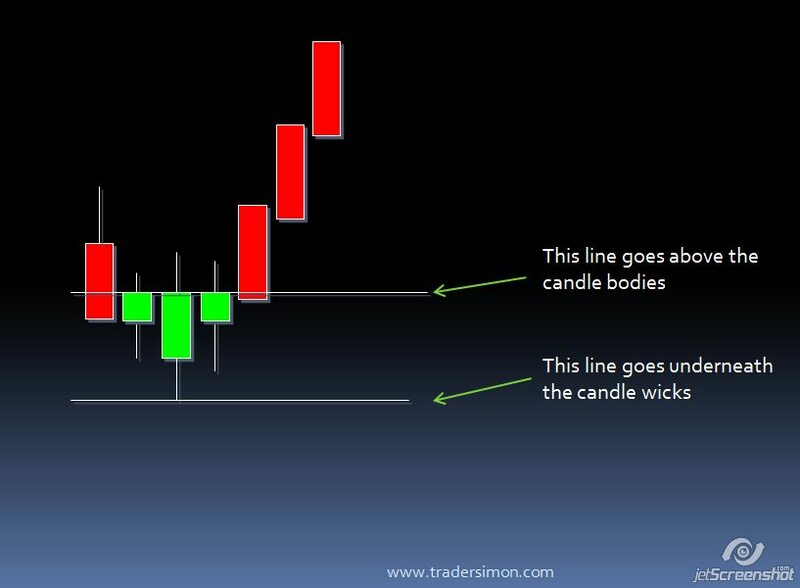 Then draw a line across the highest candle wick. Your stoploss will go a pip or two above this point. 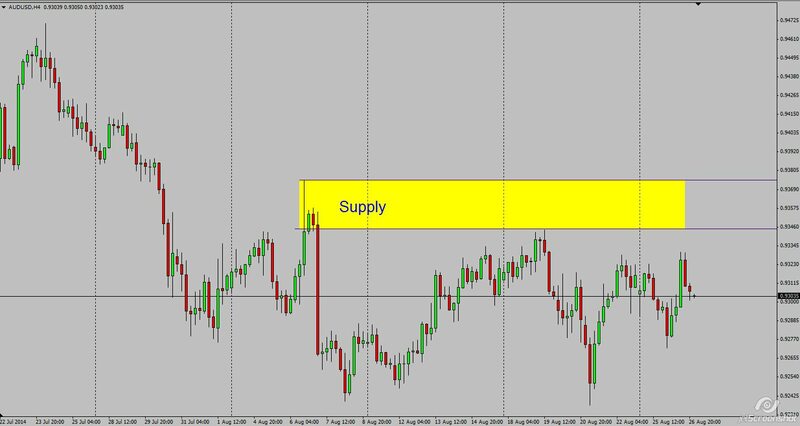 You should now be able to recognise and draw a supply or demand zone, and additionally know where to place your stoploss. Here we have a supply zone marked in yellow on the 4 hour AUDUSD chart. Price moved away quickly forming a supply zone providing an area to sell when price eventually returned. 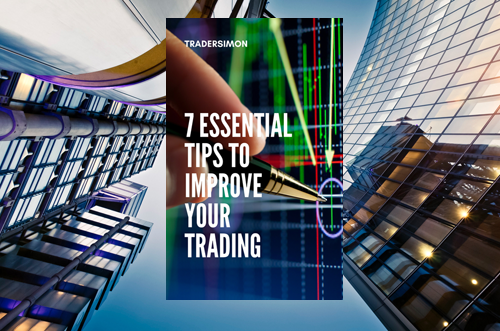 One point to note is the market is not always as accurate as we would like it to be – sometimes your zone will be missed by a few pips, other times price will retrace deep inside your zone.In this example, you may have missed the entry by a few pips. 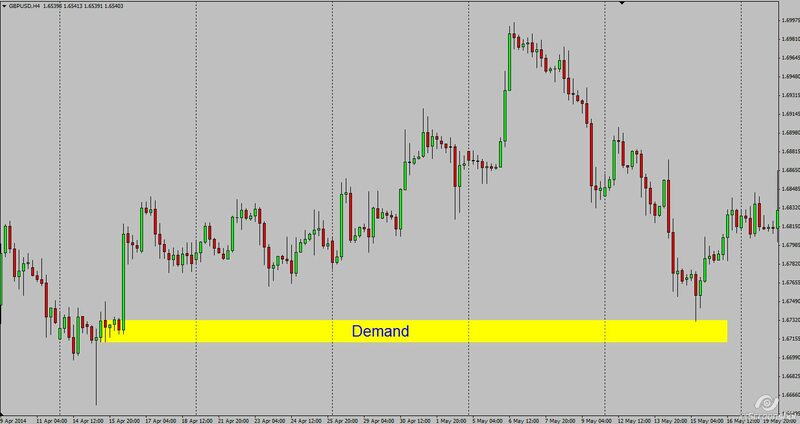 Finally, we have an example of a demand zone on the GBPUSD pair. 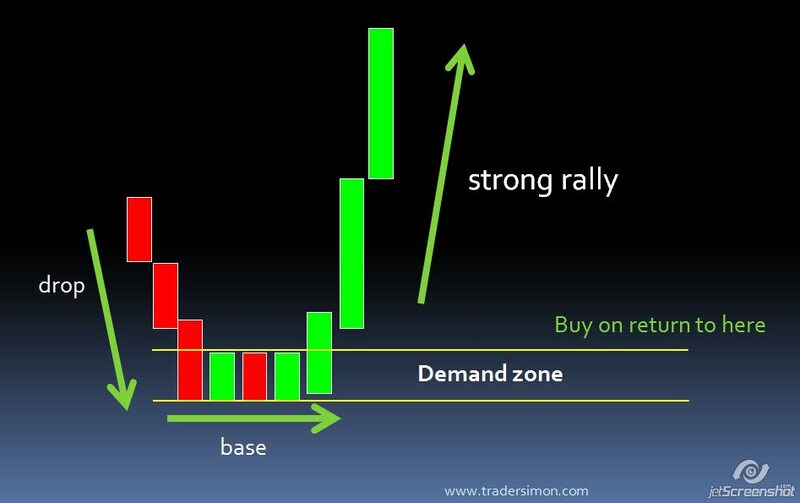 Price shot upwards creating a demand zone. The return to the zone was a good buying point. We have only skimmed the surface of supply and demand analysis – there is a lot more to learn. In future articles I will cover supply and demand in further detail. 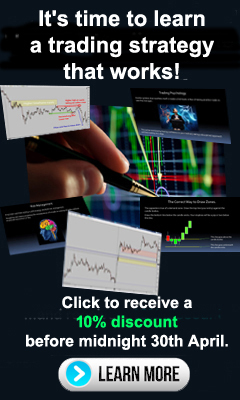 Why did gold really bounce?Why do most traders fail?